University of Pennsylvania School of Dental Medicine (Penn Dental Medicine) has launched its second course through Coursera, the online educational platform that offers universal access to courses developed by top universities and organizations around the world. The course, titled “The Oral Cavity—Portal to Health and Disease,” opened for enrollment on Coursera’s website on Sept. 18 and will continue to be offered on a rolling basis. 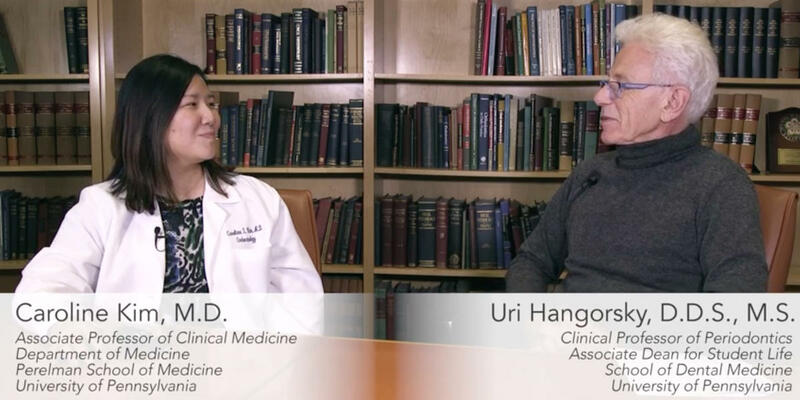 The course addresses the connections between dentistry and medicine and is presented in an interview format led by Uri Hangorsky, D.D.S., M.S., Clinical Professor of Periodontics and Associate Dean for Student Life at Penn Dental Medicine. Specialists in seven areas of medicine highlight the ways in which oral health and general health influence each other. “It has become increasingly clear that the oral cavity is intimately tied to overall health,” says Dr. Hangorsky. “In this course, we summarize all the recent advances and highlight the relationship between different medical specialties and oral health.” Thomas Sollecito, D.M.D., Chair and Professor of Oral Medicine, and Eric Stoopler, D.M.D., FDSRCS, FDSRCPS, Associate Professor of Oral Medicine, both of whom also have appointments in Penn’s Perelman School of Medicine, also provide commentary in the course videos. Katherine France, D.M.D., a current oral medicine resident, is the teaching assistant for the course. Each week’s session features an interview with a different Penn Medicine specialist. The topics covered include pain management, diabetes, cardiology, various skin conditions that also appear in the oral cavity, blood and bone marrow cancers, and certain kinds of head and neck cancer. Dr. Hangorsky credits the ability to bring this course to fruition to Drs. Sollecito’s and Stoopler’s positions in the University of Pennsylvania Health System and close working relationship with many Penn Medicine specialists. The course developers see value in the material for a wide audience, from physicians, dentists, and other health care professionals to dental students, college students contemplating health care careers, or any individuals interested in learning more about the oral/systemic health connection. Coursera learners can take the course, including exams and quizzes, for free, but must pay a fee if they wish to receive a certificate documenting their achievement. The Penn Dental Medicine Coursera courses are among the nearly 100 courses offered by the University of Pennsylvania on Coursera.